President Bush said Monday night he will send as many as 6,000 National Guard troops to the U.S. border with Mexico to help stop the flood of illegal immigrants, part of an administration drive to win conservative support in Congress for an election year overhaul of the nation's tattered immigration laws. "We do not yet have full control of the border and I am determined to change that," the president said in a prime-time address from the Oval Office. With polls showing a majority of conservatives disapproving of Mr. Bush's handling of immigration, CBS News chief White House correspondent Jim Axelrod reports the main focus of his address was directed at those who feel he's been too soft tightening borders. Mr. Bush gave strong support to a plan that would give many of the 12 million illegal immigrants in the United States an eventual chance of citizenship — a move derided by some conservatives as amnesty. He rejected that term. "Amnesty would be unfair to those who are here lawfully – and it would invite further waves of illegal immigration," Mr. Bush said. But Mr. Bush rejected the idea of mass deportations. "It is neither wise nor realistic to round up millions of people, many with deep roots in the United States, and send them across the border," he said. "There is a rational middle ground between granting an automatic path to citizenship for every illegal immigrant and a program of mass deportation." The Guard troops would mostly serve two-week stints before rotating out of the assignment, so keeping the force level at 6,000 over the course of a year could require up to 156,000 troops. Still, Mr. Bush insisted, "The United States is not going to militarize the southern border." CBS News correspondent Bob Fuss reports the president's speech was timed to try to get an immigration bill through Congress as the Senate resumes debate on a measure to allow most illegal immigrants to stay. The rare televised, prime-time Oval Office address signified the high stakes for Mr. Bush, who has been asking for immigration overhaul since his the 2000 campaign. 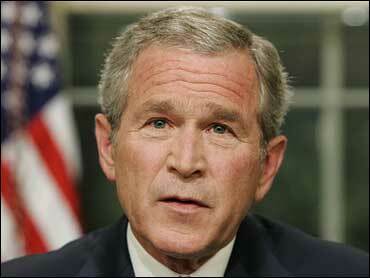 Mr. Bush said the National Guard troops would fill in temporarily while the nation's Border Patrol force is expanded. He asked Congress to add 6,000 more Border Patrol agents by the end of his presidency and to add 6,700 more beds to detain illegal immigrants while they are waiting for hearings to determine that they can be sent home. The Border Patrol would still be responsible for catching and detaining illegal immigrants, with National Guard troops providing intelligence gathering, surveillance and other administrative support. Yet the National Guard troops would still be armed and authorized to use force to protect themselves, said Bush homeland security adviser Fran Townsend. They are to come from the four border states — California, Arizona, New Mexico and Texas — but those states' governors may also seek Guard troops from other states. Some governors along the border expressed concerns that Mr. Bush's plan would overextend troops who have served in Iraq and Afghanistan. California Gov. Arnold Schwarzenegger, a Republican, said troops might provide short-term relief, but he does not believe border protection is an appropriate role for the National Guard. California has thousands of Guard troops in Iraq and might need them in case of earthquakes, floods or other emergencies, Schwarzenegger said. "So if you have 6,000 in Iraq and send another 6,000 to the border, what do we have left?" Schwarzenegger said Monday. But another Republican border state governor, Rick Perry of Texas, said he was glad the administration had decided the Guard had a role to play along the border. "We have the ability to multitask," Perry said. "[The National Guard] can handle the responsibility, but it's going to hurt the training," CBS News Military Analyst Army Col. Mitch Mitchell, Ret. explained. "They can only do so much and they don't have many days out of the year to train. If they go from one mission, to another, to another, then they're not going to get all the training they need." The White House wouldn't say how much the deployments would cost, but said the troops would paid for as part of $1.9 billion being requested from Congress to supplement border enforcement this year. The White House hopes deployments to the border will begin in early June. Many congressional Republicans said they support Mr. Bush's plan to use National Guard troops at the border. But he ran into criticism from Democrats and some other Republicans. "We don't need a military solution to break a political stalemate," Sen. Richard Durbin, D-Ill., said in the official Democratic response. Durbun said his party is "willing to support any reasonable plan" that will secure U.S. borders, including the deployment of National Guard troops. But Durbin said Mr. Bush's proposal to use troops "raises serious questions about the future of the National Guard" and its ability to train and to respond to national emergencies. Democratic Senate Leader Harry Reid of Nevada said "It is not enough for President Bush to tell us he wants to increase security at our borders. After all, he's had five years to do it. If he wants to be credible on border security, he must acknowledge his mistakes and commit to fixing them." Some of the president's toughest criticism came from his own party. "If the president thinks by taking one step forward with enforcement the House will follow with two steps backwards with amnesty, he's confusing us with the Senate," said Rep. Tom Tancredo, R-Colo.
House Majority Whip Roy Blunt, R-Mo., indicated Mr. Bush may have some trouble getting some conservatives on board with his overall plan. "While I appreciate the president's willingness to tackle big problems, I have real concerns about moving forward with a guest worker program or a plan to address those currently in the United States illegally until we have adequately addressed our serious border security problems," Blunt said. Mr. Bush said the nation has more than doubled the size of the Border Patrol during his presidency and has sent home about 6 million people entering the United States illegally. Still, he said, that has not been enough. "For decades, the United States has not been in complete control of its borders," the president said. "As a result, many who want to work in our economy have been able to sneak across our border, and millions have stayed." He called for enactment of a guest worker program to allow immigrants to take low-paying jobs, and he said employers must be held to account for hiring illegal immigrants. He said that a tamperproof identification card for workers would "leave employers with no excuse" for violating the law. And he stressed that those who want to earn citizenship should have to assimilate into society, learn English, pay fines for breaking the law and pay back taxes. "What I have just described is not amnesty," Mr. Bush said. "It is a way for those who have broken the law to pay their debt to society and demonstrate the character that makes a good citizen." The president's call for tougher border security is part of a broader plan to overhaul a system that he has described as inhumane, with desperate foreigners risking their lives for a chance to earn U.S. wages. The issue raises emotions on all sides, with many Americans and influential conservatives in Congress angry that foreigners are taking jobs and draining resources across the country. The White House hopes that the tougher security will be enough to get House conservatives to support the work permits and citizenship proposals that they have been opposed to. A bill that passed the House last year ignored those ideas and instead would increase criminal penalties for illegal immigrants and construct 700 miles of fencing.